Capturing my life one sketch at at time. A sketch to practice drawing/painting water inspired by a photo I took on a trip in Florida. 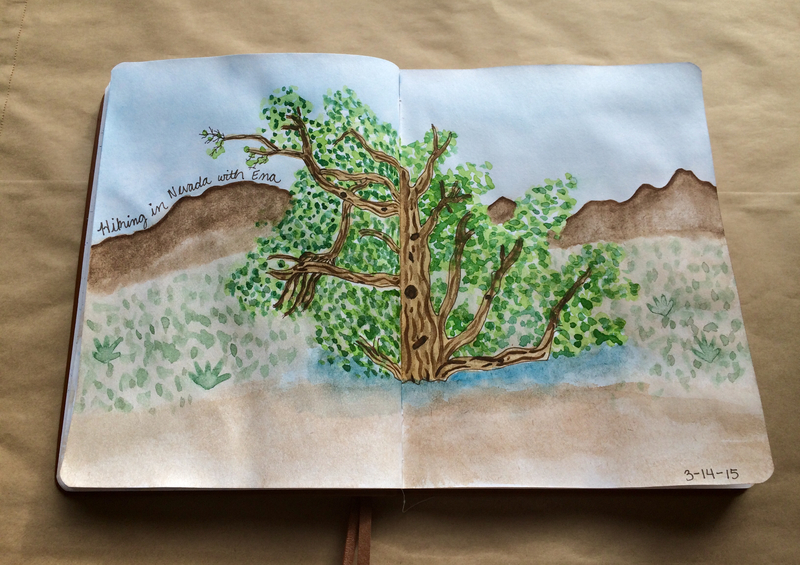 A sketch to practice drawing trees inspired by a photo I took on a trip to Las Vegas. 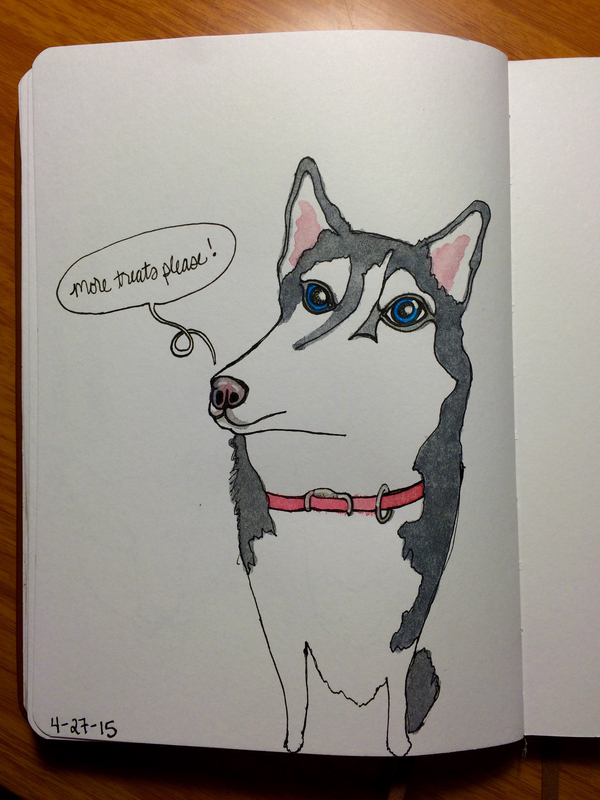 A new semester of Sketchbook Skool started! This assignment had us turn random ink blots into something from our imagination. This assignment had us turn our weekly sketches into a collage. 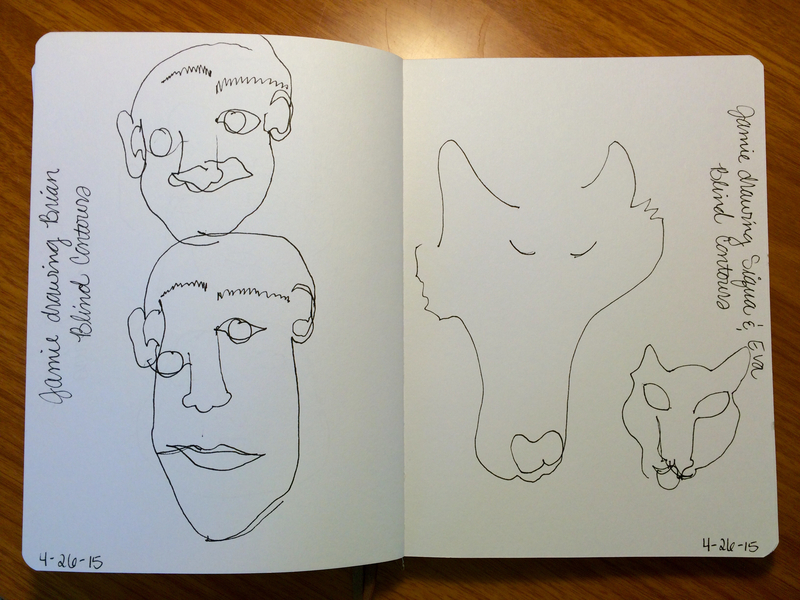 The second week of klass had us practicing blind contour portrait sketches…very tricky! This assignment had us draw a portrait sketch with a big head & a small body. I had so much fun drawing my dog Siqua! Well, that’s a wrap until next time! I love flipping back through my sketches, observing my progress, & reminiscing over the memories captured. 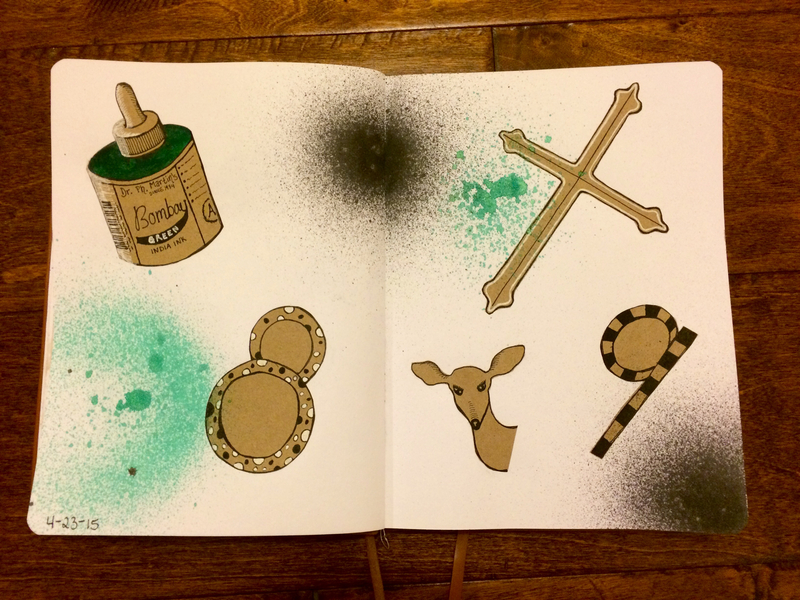 I hope you enjoy this little “tour” of my first completed sketchbook! Frigid temperatures & lots of snow has been the name of the game this winter in Ohio. 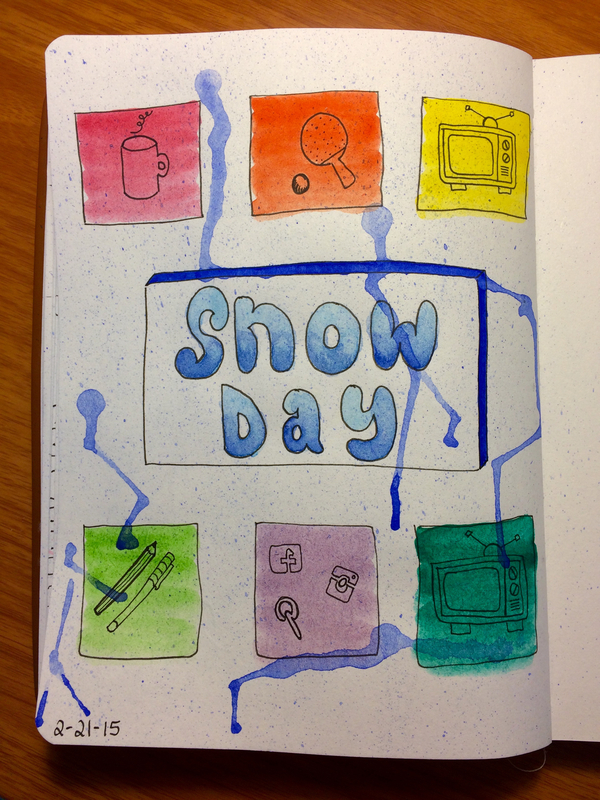 Here’s a recent sketch I did to depict my snow day activities: Coffee, ping pong with my husband, TV, sketching (of course), social media browsing, & some more TV. What keeps you busy when the weather keeps you inside? If you’re anything like me, the thought of urban sketching gives you a little twinge in your stomach. Where will I go? What will I sketch? Will people notice me sketching? What will they think? 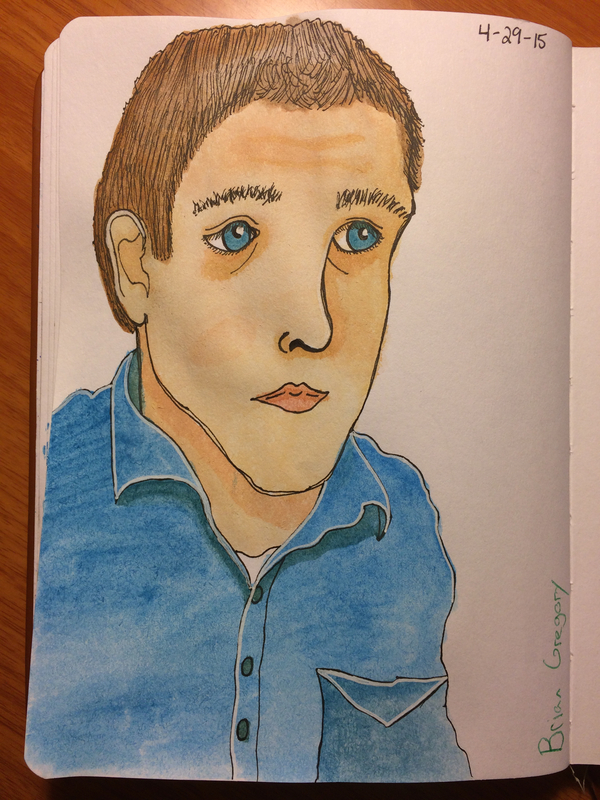 Thanks to Sketchbook Skool that twinge in my stomach is starting to get weaker over time. 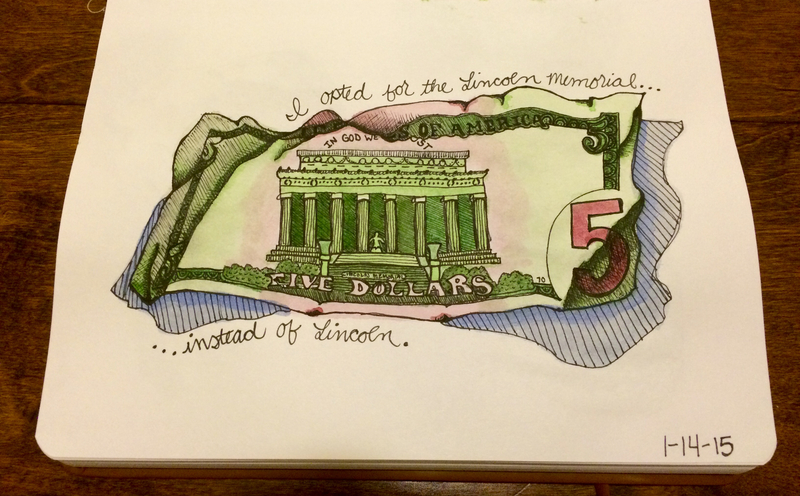 Here’s a little story about a recent urban sketching experience I had to fulfill an assignment for Sketchbook Skool. Assignment: Do an urban sketch with a strong focal point & minimal color. I was on the road coming back from a video shoot for work & decided to go on a little lunch adventure. I drove right past all of the fast food chains on the highway & took the exit for Circleville, Ohio. I’ve only been there once or twice for their famous annual pumpkin festival. 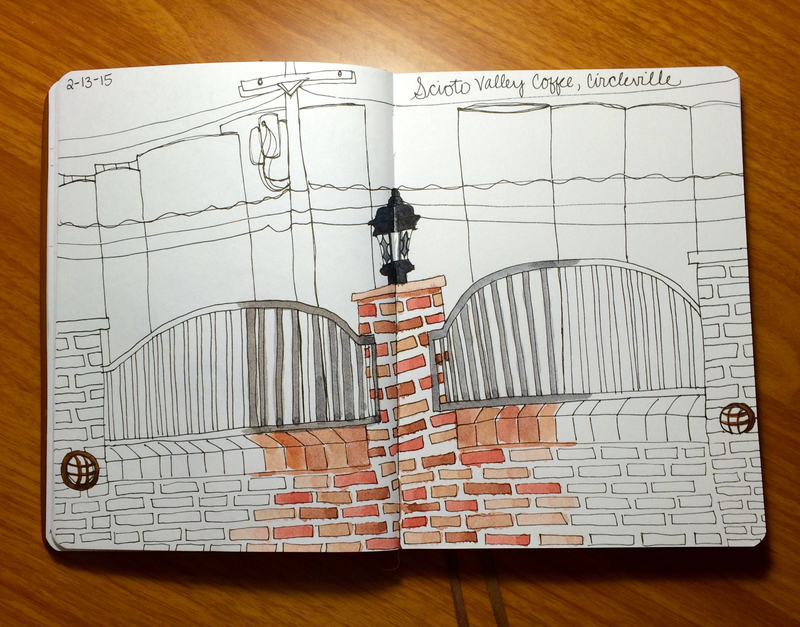 I had a tasty tuna salad croissant sandwich & some coffee at a charming little place called Scioto Valley Coffee while I did a quick sketch of the view out of the window. 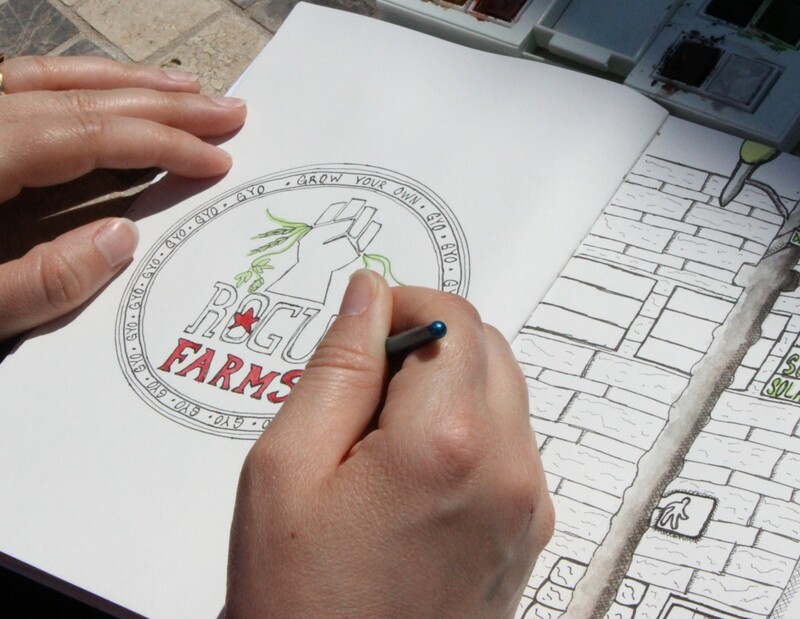 Share your favorite urban sketching adventure in the comments! 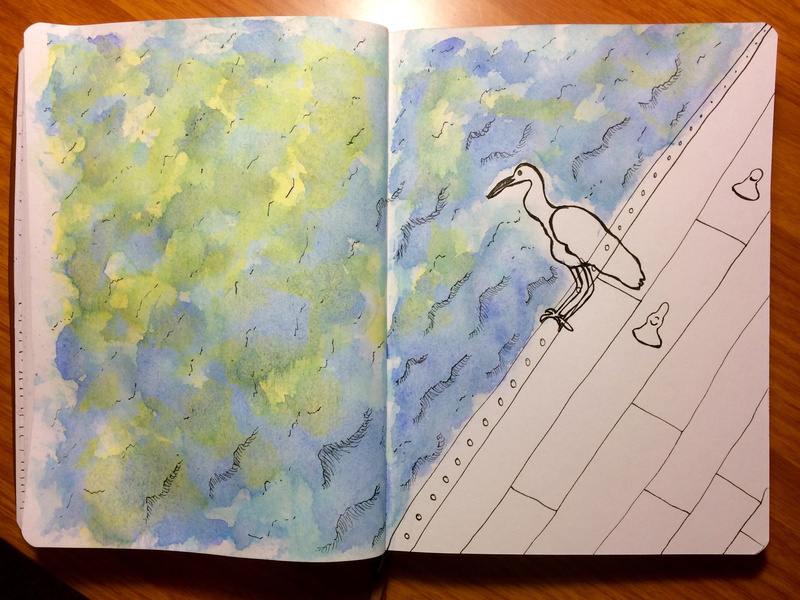 Our third assignment for Sketchbook Skool Bootkamp challenged us to lay down a bright watercolor wash & then add a colored pencil sketch on top of it. 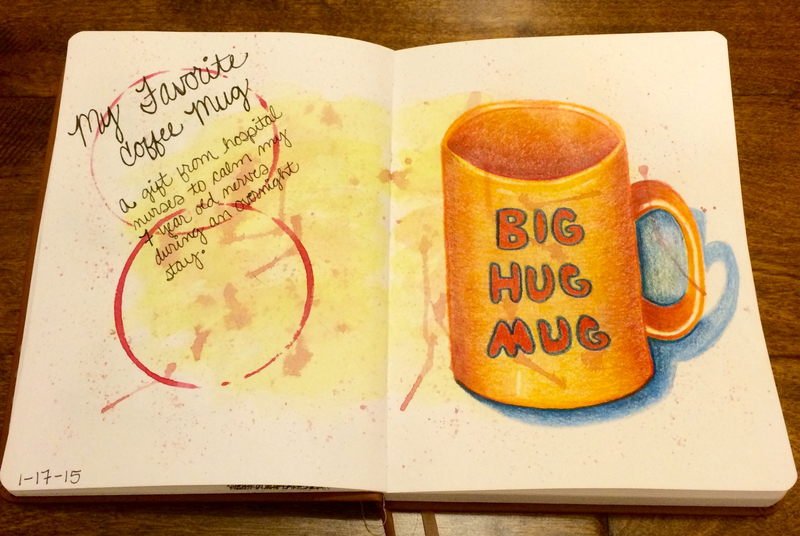 I decided to sketch my favorite coffee mug which I’ve had for about 22 years! It was given to me as a gift from my hospital nurses to calm my nerves during an overnight stay when I was about 7 years old. What’s the story behind your favorite coffee mug? For a long scary moment I stared at Mr. Lincoln’s face & contemplated sketching the front side of the bill, but ultimately decided I wasn’t up for it. 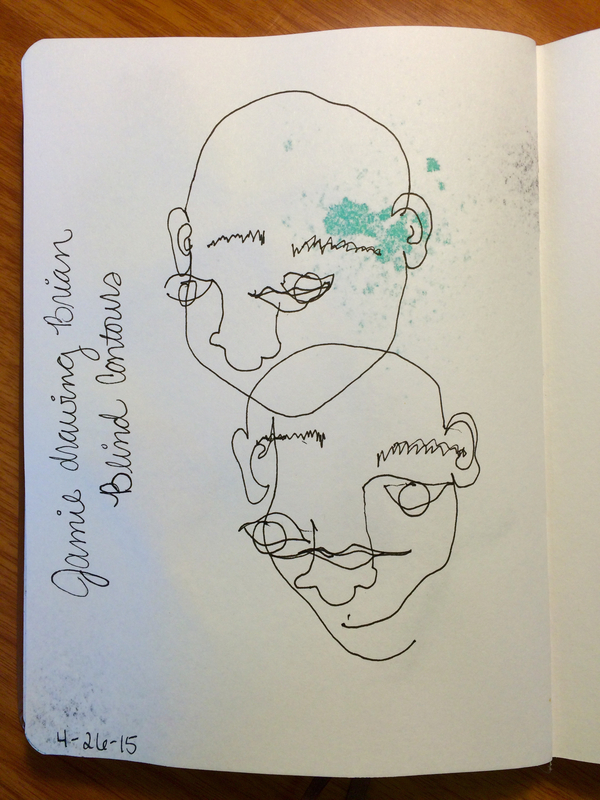 So, I flipped it over & sketched the back instead. As I spent nearly two hours doing the pen sketch I was amazed by all of the tiny details I had never noticed on the bill. Can you spot the tiny #70? 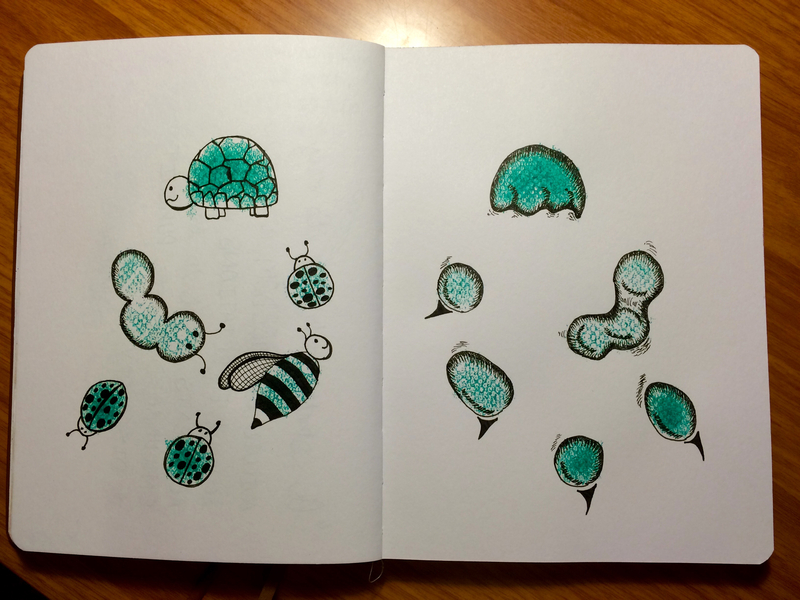 Sketchbook Skool Bootcamp just started for us “three-timers” (students who have taken all three semesters so far). 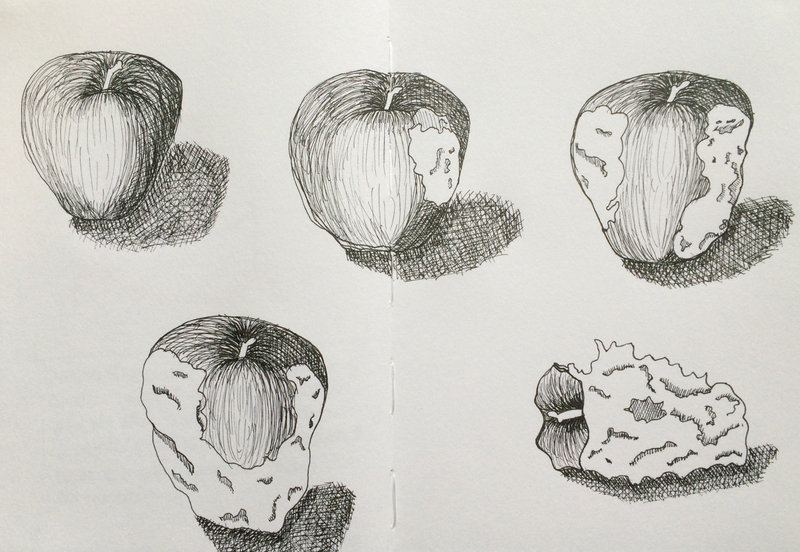 The first assignment challenged us to draw a still life of an apple to show the progression of eating it. I can’t think of a better way to get in my daily dose of fruit! 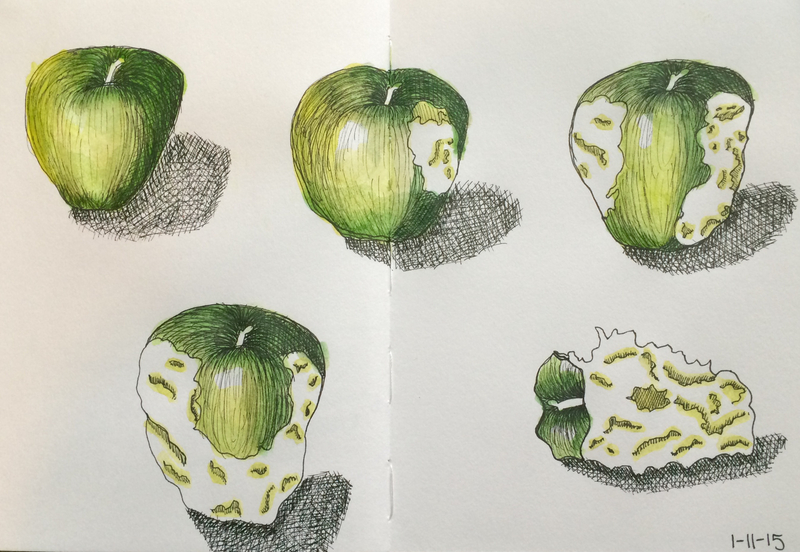 The apple was tasty & I’m really happy with my sketch, especially the fact that I managed to keep some of those pesky white highlights in certain places!